If you are a lab supplier who hasn’t considered making connections within the highly active marketplace at the University of Utah, you may be missing out on a valuable opportunity to increase lab sales and market your lab products. The University of Utah was established as a public university for researchers, academics and professionals in Salt Lake City over 160 years ago. Ranked among the top 100 universities in the world for the past consecutive 10 years, the University of Utah is home to researchers conducting innovative studies in over 80 centers and institutes, including departments in the life sciences. Biotechnology Calendar, Inc. offers a one-of-a-kind marketing opportunity in Utah with the annual BioResearch Product Faire™ Event at the University of Utah. This well-established life science marketing event offers lab suppliers the chance to stand out from their competition in a fun, yet professional networking atmosphere. Marketing your lab products to hundreds of life science professionals and increasing lab sales has never been easier. In 2012, the university’s life science R&D expenditures were ranked 47th in the country at $269.5 million. In 2013, the University of Utah was ranked 41st for NIH funding, having received $134.1 million. As of September, the University of Utah has received $121.2 million from the National Institutes of Health for the year 2014. Internal medicine has received the most NIH funding per department with 61 awards totaling $29.3 million in 2014. In 2013, the National Science Foundation gave the University of Utah $37.2 million in research funding. Construction on the $36.4 million Oral Health Education Building is scheduled to be completed in December 2014. The school’s endowment was $670.4 million in 2012. Biotechnology Calendar, Inc. events offer quality services to lab supply sales representatives and researchers alike. These enjoyable, well-organized events connect life science professionals with the lab products and services they are looking for. Enjoy free parking as an exhibitor and a delicious catered lunch whether you are a vendor or researcher. Experienced event staff are available from the show’s start to finish to make sure researchers get all the information they need from vendors, and sales representatives have the opportunity to meet promising, well-qualified leads. When you exhibit at Biotechnology Calendar, Inc.’s University of Utah event, you will meet a high percentage of decision-makers in attendance. 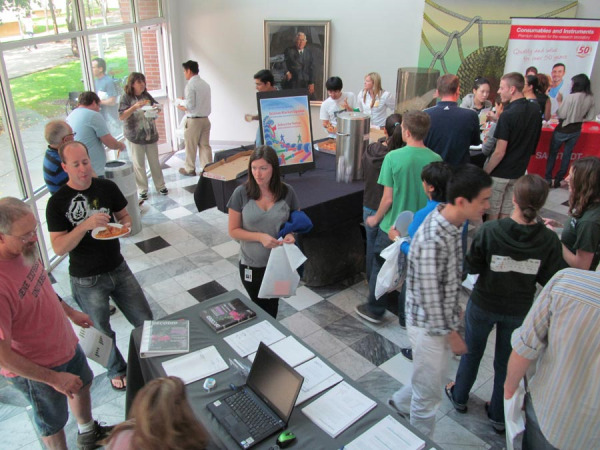 Last year, the BioResearch Product Faire™ Event at the University of Utah attracted 187 attendees. Of these attendees, over 65 were qualified leads such as purchasing agents, professors, post docs and lab managers. The attendees came from 18 different research buildings and 32 science departments. If you would like to market your lab products and increase lab sales in an up-and-coming research marketplace, Biotechnology Calendar, Inc. invites you to exhibit at the BioResearch Product Faire™ Event at the University of Utah on October 23rd, 2014. To learn more about life science marketing opportunities in other regions of the United States, please see the 2014 schedule and 2015 schedule. Click on the exhibitors button below for an in-depth list of research funding statistics and life science marketing event information for the University of Utah.